Angel Art, Other manifestants of automatic drawing. 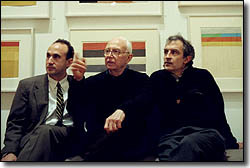 Elsworth Kelly, Maudee Cannon, M.K. Shibek, Gipsy Shennan, Jack Langridge-Gould, Gregory von Seewald, Yagihashi Tsukasa. 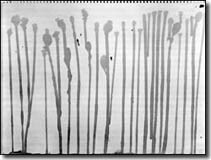 Elsworth Kelly's automatic work has not been more profound compared to the other artists listed in this section of angel art. Other than the others, Kelly (1923) is a famous artist who has work in practically every relevant museum in the world. Maudee is, as she bluntly insists, an existentialist. With the tragic suicide of her mother, Maudee awoke realizing that the decision whether to live or to die is made with every dawn in complete solitude and unnerving freedom. Maudee chose to live at the extreme limits of possibilities available, out there where stars shine in a vast region of black unknown. Familiar already with the spontaneity of Surrealist automatic drawing, Maudee quickly absorbed an oriental version of it even before Zen Buddhism became popular with the beatniks and flower children of the 1960s' counter-culture. 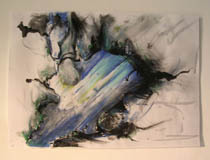 Angel drawing 1 Lies beneath a huge spiderweb spun between mountains. In this hidden valley, people live in small circular huts and eat only the greenest grass at the same time each day. Angel drawing 2 This is where pious flagellants go when they want either to wash away the heavy chains of religious belief, or to drawn themselves in despair. Many are rescued by water sprites and return to the world. Others surface unexpectedly drunk on a very sweet wine that runs from an underground spring. Angel drawing 3 Is the cookie cutter of cities and the master image for millions of invisible tattoos on crumbling streets. Jack Langridge Gould was recently a student at the University of South Australia when he created this drawing as part of an automatic drawing project. Gregory von Seewald produces occult and mystical artwork in a variety of media. The angel drawing is called 'Aiwaz' and was created according to the methods of Austin Osman Spare and the works of Aleister Crowley. Aleister Crowley is probably the worlds best known occultist and Satanist. 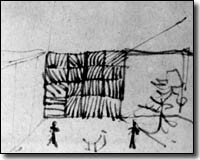 He stated that his books were written by automatic handwriting, being channeled from a higher being called Aiwaz. Later, he stated that Aiwaz was an aspect of his personality. 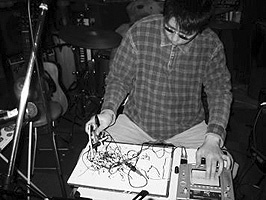 Yagihashi Tsukasa is an artist who translates ideomotoric movements and automatic drawing to music. The artist performs angel drawings and music live on stage and names it Jabrec Art Music! Yagihasi is well known for his study of sacred geometry in relation to some early Hindu Mathura buddhism sculptures. The patterns Tsukasa discovered coïncide with the patterns of automatic drawing.